Long time PC users probably aware of Safe Mode feature present in Windows operating system. The safe mode feature is useful while troubleshooting startup issues as it loads Windows with limited set of drivers and files. Interestingly, majority of Windows and Microsoft Office users are not aware of the existence of safe mode in Office applications. Yes, Safe Mode feature is not only available in Windows but also in Office programs. What’s even more interesting is that Office safe mode is present in every version of Office since Office 2003! Just like the safe mode feature of Windows, the safe mode feature in Office also helps you troubleshoot startup problems. More often than not the safe mode is used when one of the Office applications fails to start. Even though Microsoft Office automatically starts a program in safe mode when it encounters startup issues, at times you might want to run Office in safe mode to troubleshoot add-in or extension issues. When you start an Office program in Safe mode, you can’t save templates, toolbar/ribbon customizations are not allowed, recovered documents are not automatically recovered, all command line options are ignored except /a and /h, the auto correct list is not loaded, and documents with restricted permission can’t be created or opened. Running an Office program in safe mode is pretty easy. All you need to do is hold down the Ctrl key while clicking on an Office application in the Start menu/screen, and then click Yes button when you see the confirmation box to quickly start the Office application in safe mode. For instance, to open Word 2010/2013 in safe mode, hold down the Ctrl key and then click on the Word 2010/2013 entry in the Start menu/screen to see the confirmation dialog, and finally, click Yes button to open the program in safe mode. There is also an alternative method to open Office applications in safe mode. 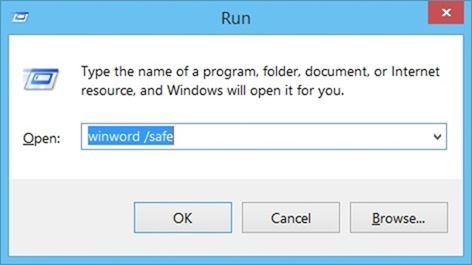 You just need to open up the Run command box, type winword /safe to start the Word program in safe mode. Just like Word, you can run other Office programs such as Excel, PowerPoint, and Outlook in safe mode by entering appropriate commands in Run command box. Excel /safe and then press enter. Outlook /safe and then press enter. Powerpnt /safe followed by enter key. How to know that an Office application is opened in safe mode? It’s easy. When an Office application is running in safe mode, Safe Mode text will appear on the title bar, right next to the application name. And if your Office application is failing to start ever in the safe mode, you probably need to repair the installation by following our how to repair install Office 2013 guide. How to download Office 2013 from Microsoft using your product key guide might also interest you. The option to RUN winword/safe brings up a window that says it can’t find winword .. same for excel/safe. Holding down the control key works but run does not. Windows 10 on a Surface Pro 4 running Office 2016. Thanks for pointing out the typo. Yes, we took a long time! Elliot points out a typo in 2015 and it still isn’t fixed? I really want to know how to start Outlook while in Safe Mode. 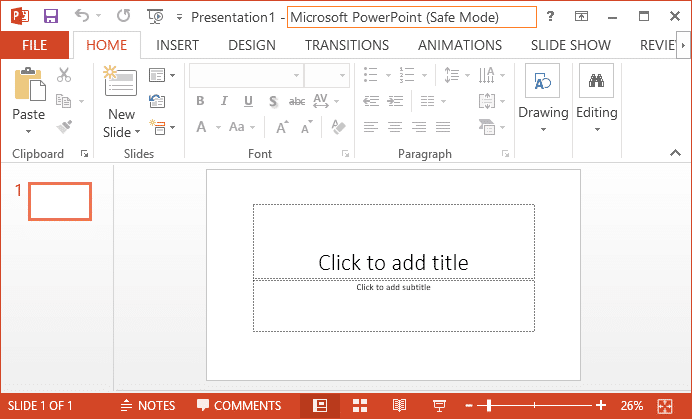 The shortcut for powerpoint should be Powerpnt /safe instead of ‘Powerpng /safe’. Not sure of this works on all computers but it works on mine.